It absolutely must be rated for outdoor use. It should be rust resistant. 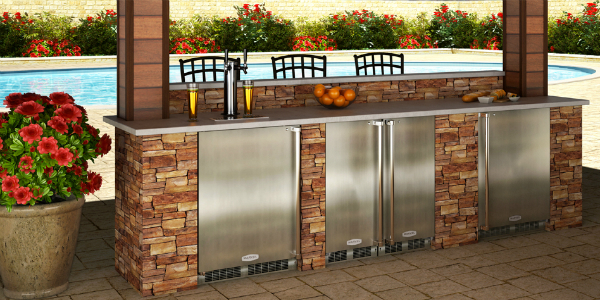 It should be designed to be built-in if installed into an outdoor kitchen island or cabinet. Outdoor refrigerators are at a disadvantage simply by being outside. Outside temperature can change drastically—from very hot in the day, to very cool at night. This makes it difficult to keep everything cool inside at an even temperature. To compensate for this, outdoor refrigerator are designed with compressors that work harder. Additionally, weatherproofing is required for the electrical components. Even when built into an outdoor kitchen island cabinet or some other outdoor fixture, outdoor refrigerators can be exposed to water from rain, humidity condensation, splashing from a swimming pool, or the like. Electricity and water a dangerous mix, so special design precautions are taken to reduce the risk of electrocution. Check that your fridge is UL (Underwriters Laboratory) Approved for outdoor use. *Keep in mind that even outdoor refrigerators have an optimal operational temperature range—often between 50ºF and 95ºF. 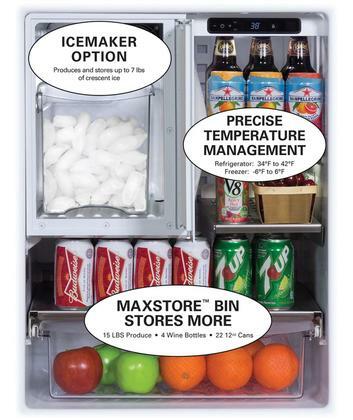 Check the operation or installation manual to be sure your fridge will work in your outdoor environment. Also, you might want to power-off and empty your outdoor refrigerator during the off season if it's built-in to an outdoor kitchen island, or other fixture, and must remain outdoors. 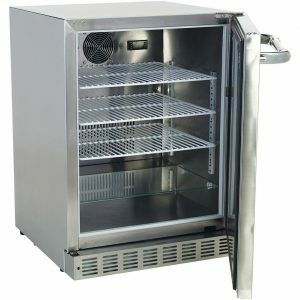 Almost all outdoor fridges are made from stainless steel for its ability to resist rust. However, not all stainless steel is made with the same level of rust-resistance, and can still rust under the worst of wet-weather conditions. 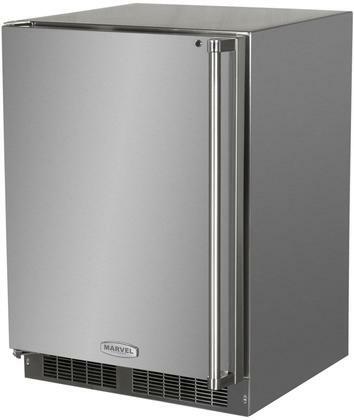 Look for an outdoor fridge with a higher grade of stainless steel. While more affordable, lower grades of stainless steel are more susceptible to rust. Less expensive refrigerators may be made of plastic-wrapped steel, which is an inferior method of rust-resistance. 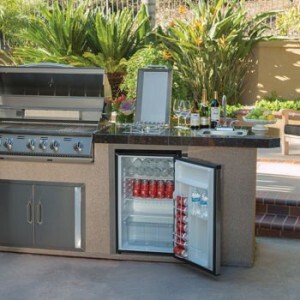 Installing Your Outdoor Mini Fridge into an Outdoor Kitchen Island? Refrigerators work by taking the heat out of the fridge, and releasing it into the air around it. This is why most refrigerators need a few inches of ventilation space on all sides, so that the hot air can blow away and allow for more heat to come out of the fridge. When you build a fridge into a cabinet or a wall, this prevents air from circulating around the fridge, and inhibits the refrigerator's ability to cool the inside. That's why some “bulit-in” models are specially designed to have vent on the front. This allows the hot-air to escape, while allowing you to install the fridge snugly into your outdoor kitchen island or cabinet. If you install a “freestanding” fridge into your island without proper space and ventilation, it will not only fail to refrigerate its contents, it may overheat and cause damage as well. The advantage to a freestanding outdoor refrigerator is that you can place it anywhere. You can set it closer to your guests while entertaining, or by your outdoor kitchen grill while preparing food, or bring it into your garage in the off-season. Some built-in models can also be freestanding and placed anywhere if the back and sides are designed to resist the elements. –> Read more about outdoor refrigerators here. Locking doors, to prevent unwanted access, such as to small children. 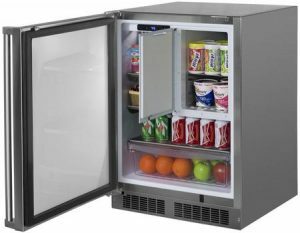 There are a lot of reputable refrigerator brands that make good outdoor compact refrigerators. I've chosen these main 3 suggestions because these models represent some of the most basic needs to more luxurious amenities in the the middle price range of outdoor mini refrigerators. Marvel's Outdoor Refrigerator Freezer has just about everything you'd get in a full-sized fridge, but in a smaller package. 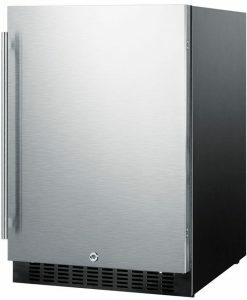 With its corrosion-resistant stainless steel exterior, this fridge is certified for outdoor use, and designed to withstand the elements such rain, high humidity, and heat—performing in temperatures as high as 115°F. Thermal-efficient insulation ensures optimum cooling performance, while the Dynamic Cooling Technology™ cools nearly two times faster than other models. Can be built-in, or freestanding. Controls allow you to manage the temperatures of the refrigerator and freezer compartments independently. The easy-to-clean white interior enhances the white LED illumination for better viewing of fridge contents. Audible alarms for “door ajar” and “high or low temperature” help you keep your fridge contents at optimal temperature. Close Door Assist System™ that automatically draws the door closed, ensuring it's never accidentally left ajar. Door lock for added safety and security. Bull Outdoor Products is better known for it's outdoor kitchen cooking appliances, such as grills. But, they make a couple of refrigerators that are worth a look. Their “premium” outdoor mini fridge boasts a large 5.6 Cu. Ft. capacity with 3 adjustable wire shelves and one glass shelf for plenty of storage for food and beverages. 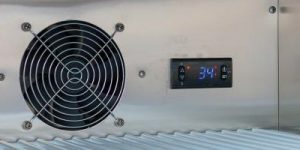 The internal temperature is maintained by a dual fan system, and controlled with a digital LED control panel in the back of the fridge, keeping the contents cool in weather as hot as 109ºF. Both the inside and outside are constructed completely out of 304 stainless steel to resist rust and weather, and the front-venting internal and external fan systems are enclosed for durable outdoor use, whether built-in or freestanding. The door is reversible, and features a lock to protect the contents from unwanted access. Summit Appliance makes a wide variety of refrigeration solutions for unusual spaces, such as small apartments, under-counter installations, and outdoor kitchens. 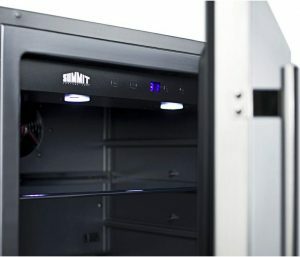 Summit's SPR627OS Series are 4.6 cu.ft. “all-refrigerators” (no freezer). 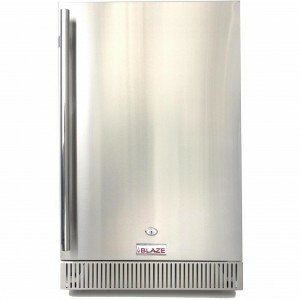 This certified commercial refrigerator is designed and constructed for use in the outdoors, and equipped with convenient user-friendly features for use in any residential or outdoor kitchen. 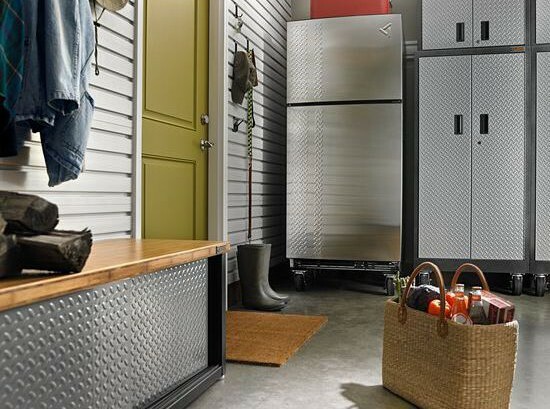 On the outside, the fully finished black cabinet and stainless steel door allow the unit to be used freestanding in the outdoors, functioning in temperatures up to 90ºF, while its front-breathable vent allows for under-cabinet, built-in installation. A keyed lock secures the interior from unwanted access. An LED light illuminates the fridge with an elegant glow. 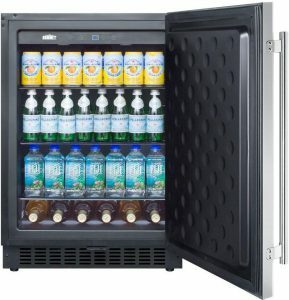 Contents are easily organized with the adjustable glass shelves, a specially slotted floor to hold bottles in place, and a flat door liner to accept larger trays. An optional shelf kit can be added for additional door storage. With an understanding of what you're looking for, and a little research for installation manuals online, it's not difficult to find the best outdoor mini refrigerators for your deck, yard, or outdoor kitchen. Check out my other articles on outdoor refrigerators for further information and recommendations. If you have any questions, comments, or suggestions for me or other readers, please leave them in the comments below. Thanks for reading. Hi, Scott. I think I have a bad compressor on a fridge that looks a lot like one of yours. (Light works but no cold.) It is the one in the picture next to “outdoor rated refrigerators.” Do you know who makes that fridge? Do you think the compressor is worth replacing? I paid $400 for it in 2013 from the guy who designed my BBQ area. Thanks for your input. I’m sorry, but I can’t remember the maker of this particular fridge in the photo. I acquired that pic so long ago. You should be able to find the maker’s mark or name somewhere on the exterior of the fridge. Probably near the bottom, embossed or printed in small letters. As for whether or not it’s worth fixing or replacing the compressor, that’s about your budget. If your refrigerator is built-in to an island or cabinet fixture of some sort, it make take more work to get into the fridge replace the compressor. If you’re paying someone to do the work, it could be a lot. Compare their estimate to the cost of buying/installing a new fridge. Fridge dimensions don’t tend to vary too dramatically, so it might be easy to replace if it is built-in. If it’s standalone, even easier. There are a number of options in that $400 price range (and even less) that you can consider. I usually recommend going up in price (if you can) when buying a new fridge — the upfront investment in a sturdier, more durable model or brand can save you on repairs and replacement down the line in the future. I hope that helps. Thanks for reading and commenting! Hi Scott – what are other options compared to Marvel. Marvel’s reviews are okay but not great. Perlick? Yes, I’d say look at Perlick, or even some of the higher-end models offered by Summit. 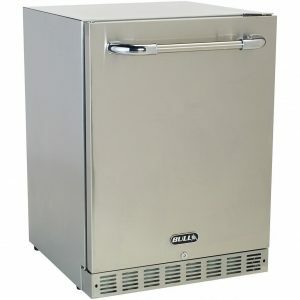 I’ve also posted this list of outdoor refrigerator brands that might be a good resource for your search. I hope that helps! Thanks for reading and writing in.